This is the first Stephen King book that I have read, and it was something! Misery is a devilish book that now occupies my mind. It will be a while before I read another King novel as it is scary how adept he is at creating a story that can affect me in such a way. Paul Sheldon, a successful writer of a series based around a heroine called Misery has broken his legs in a car crash and is rescued by former nurse and number one fan Annie Wilkes. While recovering at her house, Annie discovers that Paul has killed Misery off, she subsequently intends to keep him at her home until he writes Misery’s Return. Paul becomes aware of her unstable mental state the longer he is kept there. The villain, Annie Wilkes, has a multitude of problems which are demonstrated over the span of Paul’s “stay” with her. A scene which was particularly illuminating regarding her character was her personal album which Paul discovers on a rare visit outside of the bedroom. This scene not only helped to fill Paul and the reader in on Annie’s past which helps explain her actions in the present, but it was also very suspenseful with a real sense of anticipation of something horrible to come. Part three was simply unputdownable, as Annie and Paul progressively near the final outcome of the events that have transpired in Annie’s house. A pulsating finale is brilliantly built, with unbelievable events taking place. For so long Annie and Paul are the only characters, put with the emergence of brief appearances of other characters, the effect is dramatic. The internal monologue of protagonist Paul is ‘vivid’ and adds to the suspense of the situations he finds himself in. I found the internal monologue played a crucial part in establishing this book as a “psychological” horror, as the incessant build up of Paul’s emotions and thoughts portray the mental damage that Annie has done to him during his stay. King seems to have made attempts to have created a novel which is depthful, thoughtful and intended to be studied by students while appealing to literary critics. His attempts to create a novel such as this, does drag the story out slightly as we are repeatedly taken to the pilings, Africa and Paul’s past in King’s attempts to convey Paul’s state of mind, withdrawal symptoms and how to deal with the present situation. Though some of this was interesting and provided a different aspect to the story, some of it detracted from current action as Paul’s mind is elsewhere, while the predicament he finds himself in now is much more pressing in comparison to a past memory. 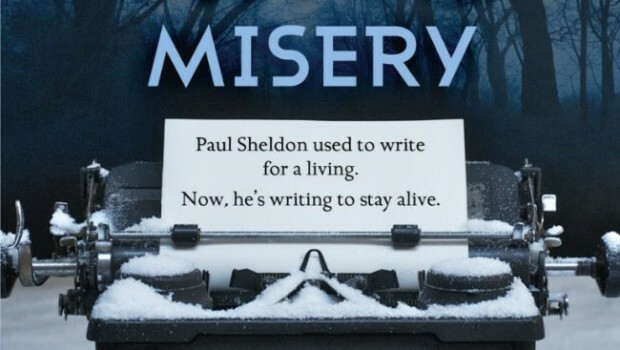 Misery is a fascinating read, and a book that isn’t to be taken lightly. It delivers on it’s genre as a psychological horror, with many shocking moments that left me with my hand over my mouth with my eyes glued to the page, wanting and not wanting to know what happens next. This is a terrifyingly good book that has a story which will be etched in your mind. This entry was posted in Books and tagged Book, Book Blogger, Book Review, Misery, Stephen King, Stephen King Misery. Bookmark the permalink. Have you read any other Stephen King books? I read ‘Misery’ years ago and it’s still one of the most chilling reads ever. Nothing less than 5 stars. When I finished, I just stared into space for a while not knowing how to react. How does the film compare with the book do you know? I love the movie and I think James Caan was perfect for the role, but it’s quite different to the book – for instance, you don’t see any of Paul Sheldon’s efforts to write the new version. Great review. I haven’t read this book since I was a young teenager, and I really want to reread it. It’s one of the few Stephen King books I don’t own. I need to track down a copy. At least I’m prepared for the next King novel I read..
Good to hear people’s varying views on King, he seems a love/hate figure. I will at some point get round to reading some more of him.